Tracking The Snow-shoe Itinerant The Denver Post "His dramatic photographs show snowstorms hovering over desolate mountains, streams clogged with ice, the white bones of aspen trees covered with snow, brittle cold nights with bright stars like giant snowflakes. Sandra Dallas for theDenver Post continues. 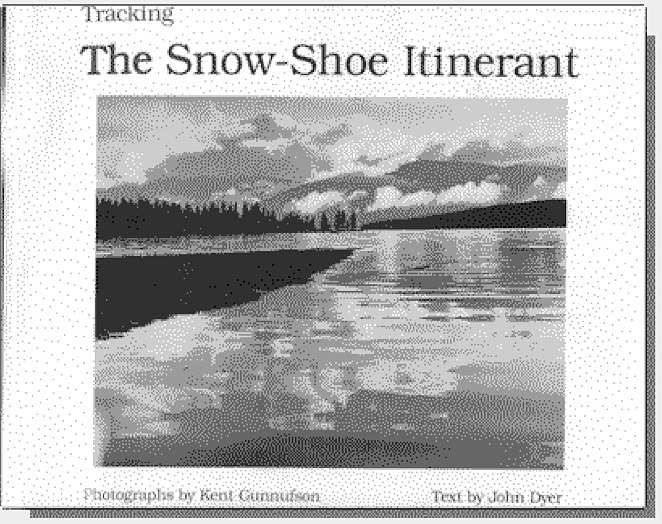 Breckenridge photographer Kent Gunnufson has used THE SNOWSHOE ITINERANT, the autobiography of the early-day Methodist circuit rider FR. John Dyer, as the basis of a photographic study of South Park and Summit County. Father Dyer’s diary, published 100 years ago, provides endless inspiration, since the preacher comments on everything from gold strikes to Godless men, from the price of a meal to the amount in the collection plate, and always he talks about the howling snow that falls 11 months of the year in the high country. "At one point Father Dyer despairs: ‘no pen or tongue can describe its awful appearance.’ But photographs can. And Gunnufson, like Father Dyer, is overwhelmed by the snow. His photographs are not of pretty mountain scenes but of the cold and awesome land at timberline that bedeviled Father Dyer. Popular Photography Magazine Regional and national publication reviews along with television exposure have been ecstatic. ""A celebration in words and pictures of a grand American Landscape," writes Dave Sargarin for the world’s leading photographic magazine, Popular Photography. He states candidly in his feature review, "The reason for this book’s being in these pages is the quality and interest of the photographs."